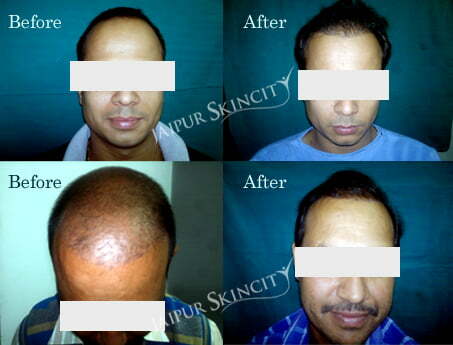 Hair Transplant is the procedure of regrowing natural hair. In the process, hair follicles from back and sides of your head (donor area) are taken and implanted in frontal bald area (recipient area). 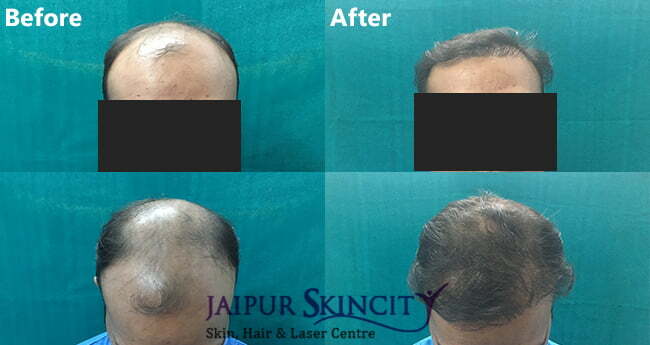 Hair follicle on back of head are permanent follicles while those in front are temporary follicles. Temporary follicles are hormone sensitive and decrease in number with age while permanent follicles are hormone insensitive. 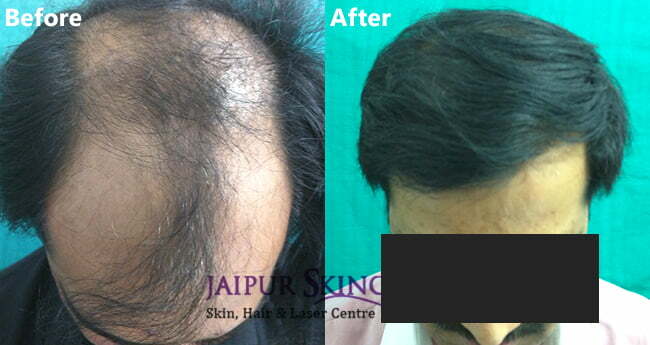 Thus in hair transplant, permanent follicles (hair) are implanted in bald area. 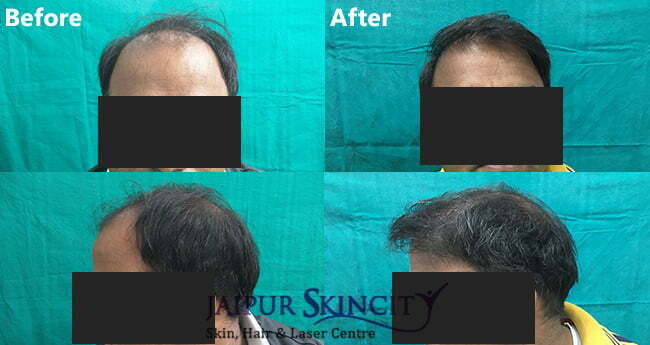 The transplanted hair grow like natural hair and never fall again. 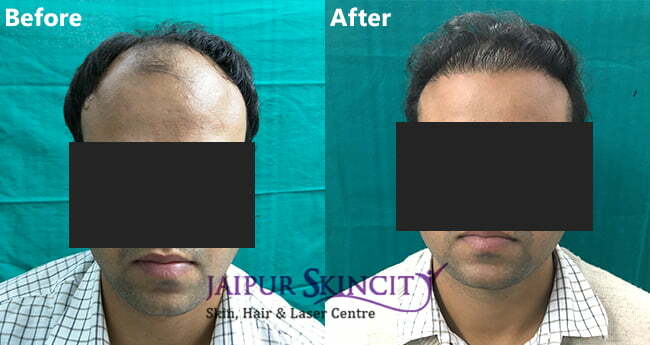 Hair transplant is a one time and life-changing surgery for most people. 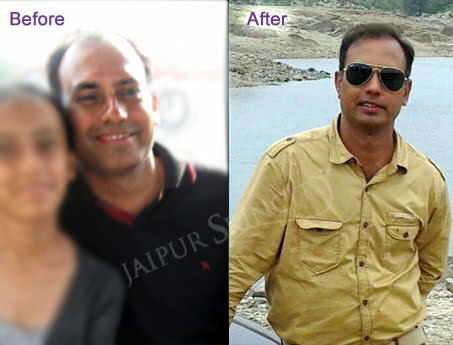 Newer FUE technique is slightly costlier than older FUT technique but our centre is providing FUE at the price of FUT and that too without compromising quality and results. 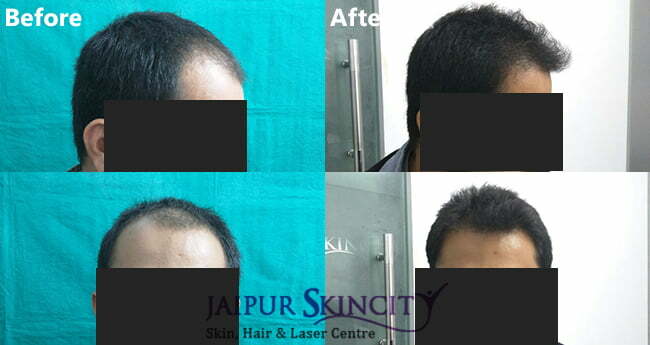 Hair Transplant Cost varies from case to case depending on the number of follicles required. To know exact price for you, kindly send your photographs or visit our center. 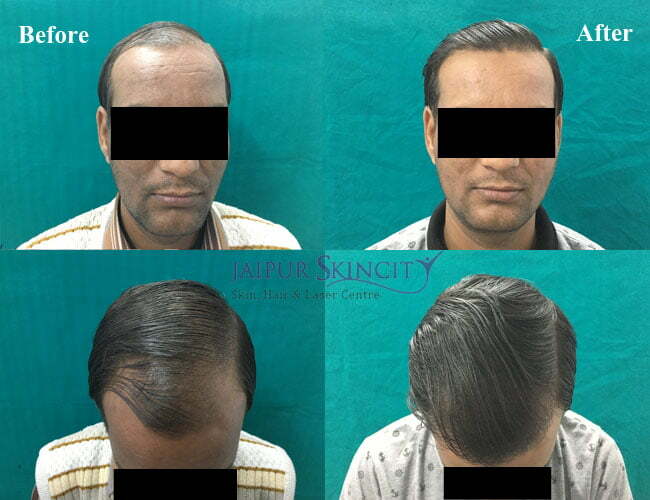 There are two techniques of hair transplant – FUT and FUE. The below table shows the difference between them. 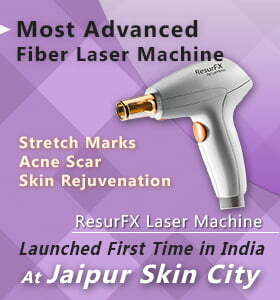 Jaipur Skincity is the first and only centre in Rajasthan to perform exclusive FUE cases. Older technique of FUT is not performed at our centre. We use imported instruments and titanium punches to perform surgery. 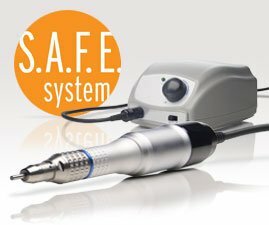 We use SAFE system for extraction of follicles. You can visit our center to see world class operation center and instruments used in surgery. Will my transplanted hair be natural or artificial? 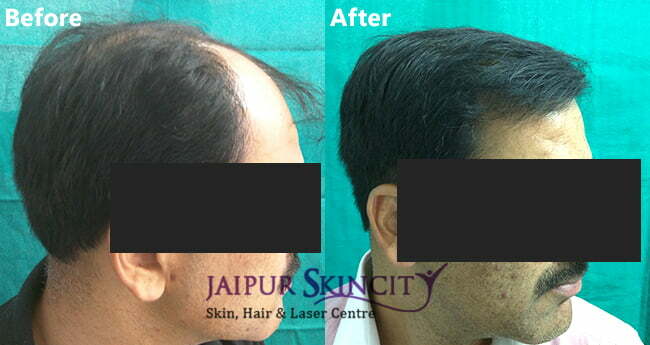 Since your own follicles are implanted on your head, the hair transplant produces permanent and natural results. Will my hair grow? Can I cut or shave them? Definitely. 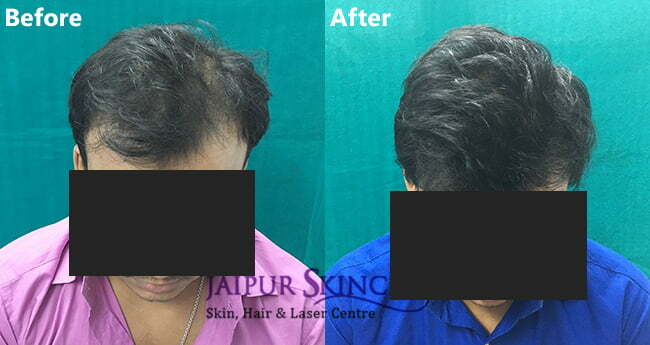 In hair transplant hair roots are implanted which continue to produce hair as in normal condition. One can cut them, shave them, dye them and style according to his desire. 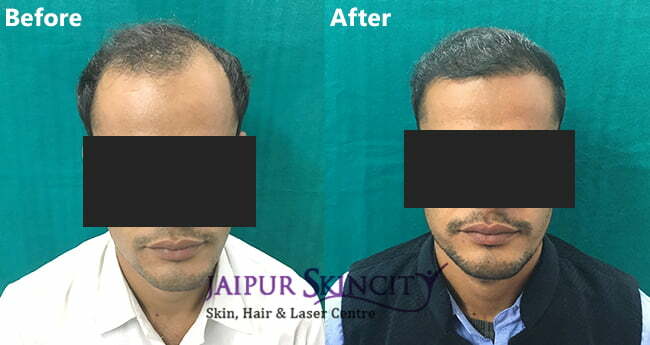 There is no long term adverse effect of hair transplant, only in rare cases swelling and folliculitis can be seen in short term which subsides within few days. How many days are required for transplant? Will I be conscious during surgery? Yes of course. Transplant is performed under local anesthesia. You can talk to us or listen to music during whole surgery. What will be long term care following transplant? No extra care is required after 10 days. Do I need to take any medicines following transplant? How much time will it take to show proper results? Hair will start growing within 10 days. 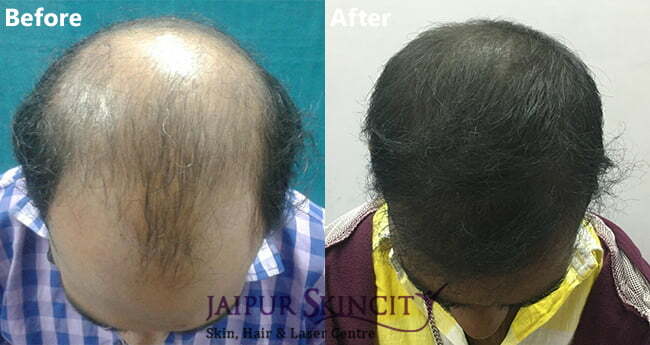 Since growth rate of our hair is normally slow, it takes 4 months to get proper results.